Yes Response helped raise money for Children In Need on Friday 13th November. A tombola took place with three prizes, which were drawn mid-afternoon. In 2015 Yes Response have collectively raised almost £400.00 for many great charitable causes. Remote areas in the UK could soon see the Royal Mail delivering letters and parcels by driverless vehicles or drones. Moya Greene, chief executive of Royal Mail stated she has to keep an eye on technology or risk falling behind the market! Amazon and google have been experimenting with drone deliveries for a while and Swiss post are now delivering parcels with pilotless aircraft! Consumers in rural areas could be the first to benefit from drone service if plans materialise where there are not vast deliveries needed. Air traffic laws is the biggest threat to these plans but who would have ever thought we would have driverless trains at airports. 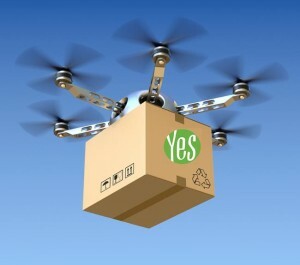 Drone delivery is certainly the way forward depending on regulations. At Yes Response we believe that the UK postal service offers very good value for businesses, thus making a cost effective and certified marketing tool. YES RESPONSE BRINGS CAPITAL SALES! Yes Response telemarketing team are very busy creating many sales opportunities for high calibre companies. This month one such lead led to a very large capital sales order of multiple machines, with the opportunity for additional orders from the same customer. Let Yes Response telemarketers identify your new sales leads to increase your sales and help improve your customer service by identifying and highlighting any problems. At Yes Response we create the opportunity to convert your prospective customers into customers. With a consistent marketing programme we can achieve and unearth new sales opportunities. Call Yes Response now to start 2016 with new certified sales leads and higher profits!